Look what I found in my treasure trove - shrink-wrapped and forgotten! Dior's Collection Makeup Palette for the Eyes was a Sephora exclusive. I purchased it because the colors were gorgeous. So, why did I toss it and forget it? I plead insanity. If you write a beauty blog, you'll understand that the latest bauble can displace one that's only a month old. Suddenly, as you focus on the latest thing your readers want to see, that month becomes two months, and two months stretch to six. At that point, to make your house livable, you find yourself throwing nice things into boxes to create room for new baubles. Those boxes can hold buried treasure. I nearly died this weekend when I unearthed this palette while petting Savannah. I had the inclination to rip into it and wear it when it dawned on me that it was more deserving of a giveaway than my fickle fingers. So, it remains shrink-wrapped and is ready to send to one of you. I'm sure any passage of time will not have affected it. Unopened powder makeup lasts forever. Just between us, opened powder makeup that has been used lasts forever if you don't contaminate it. I have no idea what I paid for it, so I cannot give you a value. I suspect it was between $40 and $50. The deadline for entries will be Saturday, September 29, at midnight. The next morning, I will use a random number generator (random.org) to select the winner. I will e-mail the winner on Sunday morning. The winner will have 48 hours to reply to my message and provide a shipping address. After 48 hours, the prize will be forfeited, and another winner will be selected. Make sure to check your e-mail - and look in your spam folder - when the contest ends. Wow, it's gorgeous! Thank you! I love the palette, thank you ! taliready at gmail dot com. I also follow the blog by email. Sweet find!! I follow with Google feed reader. This is a great giveaway. Thanks. I've really loved your recent reviews of Le Metier de Beaute products. They're not available anywhere near where I live, but I might try ordering some of the products. I love the cases for the eye and lip kits. I remember this from last year! Great giveaway - thanks! Haven't tried anything "Dior"...would love to! Oh my gosh, what a beauty!! Even if you had this object of beauty in your drawer for a year, I would still take it!!!!!!! Once again, great giveaway.. you rock! Love your blog! This is very kind of you! With some things, there's only a few ways you can respond to it's beauty, that is with a "WOWWEE" or "AHHHHHHH". This palette surely fits that category. This palette is amazingly gorgeous and I can just envision in my mind how gorgeous it would look on the eyes. This is an incredibly special giveaway as all your giveaways are. However, I can't seem to take my eyes off of it. These colors would look absolutely gorgeous on you. Are you sure you want to give it away? Anyway, thank you for another generous and fun giveaway and Good Luck To EVERYONE! I follow faithfully by email! This is a lovely palette and so are you for doing the giveaway! Happy Fall. i love finding things ive forgotten about! Ooo, ooo, ooo, would love this! Look for more forgotten items CG! I'm very glad you and Savannah were hanging out near your makeup stash! The colors look fantastic. I would love to own this! and I receive you e-mail. another gorgeous giveaway. i wanna come to your house for a treasure hunt! Such a gorgeous palette! It would be so fun to win it. wow, Christmas comes early this year with this giveaway! Oh my goodness - your self-control is more than I think I could have mustered! I follow you via email - kristicrabtree at hotmail dot com & via twitter - @lov2read68. And I retweeted your tweet! I follow via GFC and Twitter & tweeted. My email is to follow. I would love to add this to my makeup bag !! This palette is beautiful. Thanks for the opportunity. I always try all the Dior make up when I go to Sephora. I'm a broke student with great taste,lol. Thanks for the chance to win this gorgeous set! One of those things that is so gorgeous it's almost hard to use! Swoon! Thanks for the chance. Thank you for deciding to give it away! Wow, this is an amazing giveaway. I've been wanting a Dior's eye palette for so long. One of these days I will own one :) I am an email subscriber. 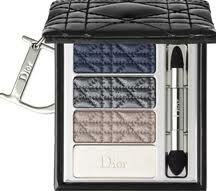 This Dior palette is to die for! Thank you for another lovely giveaway contest! I am also a faithful email subscriber! Oh I'd love to win eyeshadow from Dior! Thanks Charlestongirl for such a generous giveaway! Wow!! Such a gorgeous pallet. Stunning! That would amke a really lovely smoky eye! I follow by email, Twitter, and GFC. Great giveaway as usual! Thanks, CC! hi, yes, the colors are georgeous! I am your subscriber by email and GFC (name Radmila U). Amazing palette, I love it!! Thank you for picking for us only the very best!!!!!!!! This is a Great Giveaway, thank you. I follow you since some time now via.email but also feeds and I just added.you to my twittet account but my entries are not public. My email is zelle dot vs at gmail dot com. Whenever I can I read.your blog. It is always a fresh and beautiful way to start the day in colors! Beautiful set, I will send you an e-mail and I tweed the contest just a second ago. I am also a subscriber of this channel. I follow through email as well. I love finding makeup that I forgot about! I do this with nail polish all of the time. Thanks for the giveaway, the palette is gorgeous!!! Nice giveaway as always from you ! Dior eyeshadows are the best! Well I suppose I'll throw my hat in the ring. This is really lovely. I follow you via email and twitter. I follow through GFC [Sus] and also via Google Reader. That pallette is perfect for my hair (prematurely grey) and blue eyes. Its gorgeous. you always have a beautiful giveaways. Gorgeous eye color says Princess Teri! See my email. Dior eyeshadows - the best! If I won..... Oh how grateful I would be! Amazing! I've never had anything from Dior. Really enjoy your blog, thanks for the giveaway! What a gorgeous prize to find tucked away and forgotten, CG;I would have been jumping up and down in joy! Thank you, once again, for another fabulous giveaway. i follow your blog in google reader!! !